Selection and mix by Andrea Zarza Canova. Thanks to Brian Moser for his ideas and for agreeing to have these recordings shared on NTS Radio. This programme is dedicated to all of the unnamed performers who appear in the sound recordings and to the memory of Dr. Donald Tayler (1931-2012) who recorded and documented them. Brian Moser and Donald Tayler (1931-2012) met whilst studying at Cambridge University. After their studies, they went separate ways: Brian Moser left for Colombia in 1959 to work as a geologist within a Cambridge expedition to the Sierra Nevada del Cocuy in Boyacá, Colombia, where the flora was uncharted and there were no recorded ascents of peaks. Donald Tayler had gone to New Guinea to work for a British engineering company overseeing the construction of the foundations of a hydro-electric dam. Brian Moser stayed on in Colombia after the expedition, and at the recommendation of Dr. Gerardo Reichel Dolmatoff from the Colombian Institute of Anthropology, he met Richard Evans Schultes, an American ethnobotanist specialised in hallucinogenic plants popularly known for his book Plants of the Gods: Their Sacred, Healing, and Hallucinogenic Powers (1979), co-authored with Albert Hoffmann. 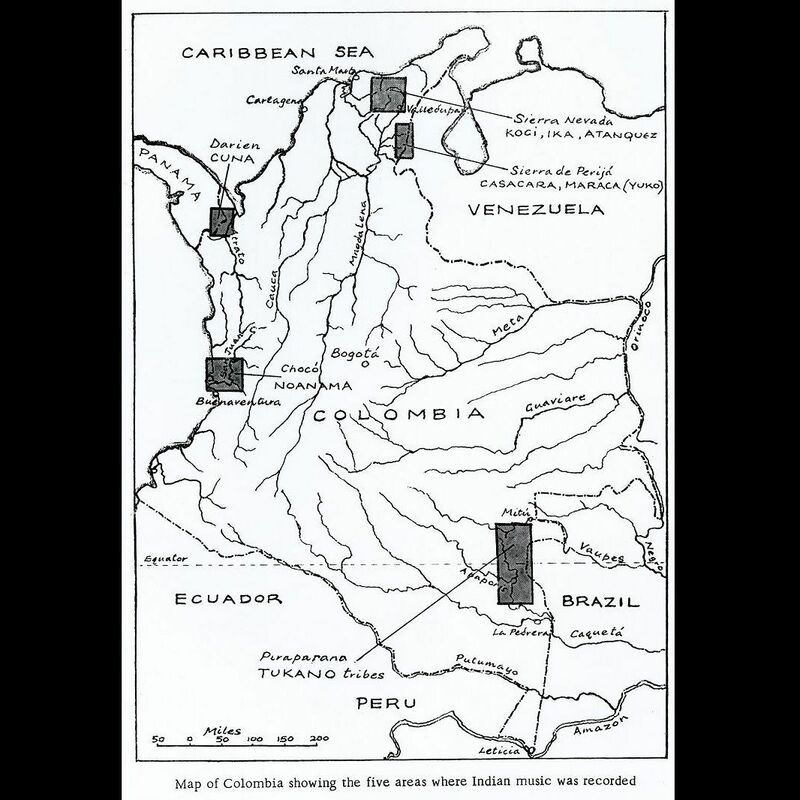 According to Moser, it was Schultes who gave him the idea to go to map the River Piraparaná, and this four-month canoe trip would be the second stage of the Anglo-Colombian Recording Expedition 1960-61. 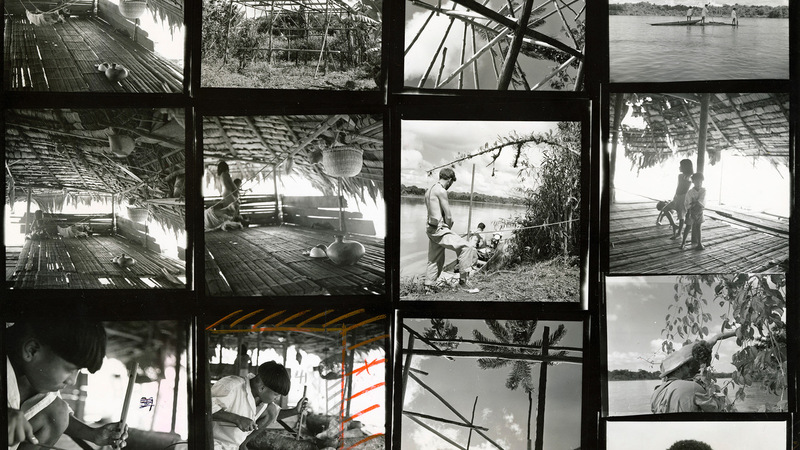 Brian Moser was 25 and Donald Tayler was 29 when they began their fourteen month journey in Colombia, setting out to visit six different Indian groups “with the main purpose of recording music and making an ethnographical collection for the British Museum. Studies were also made in the use of narcotics and stimulants, in primitive agriculture and aspects of material culture.” (Moser and Tayler, Tribes of the Piraparaná). Moser and Tayler certainly recorded music during rites and ceremonies—such as the dances from the Piraparaná malocas or the sacred chanting within important coca-taking sessions—but they did not set up special recording sessions and diminish the spontaneity or quality of that which was being recorded. Though they had no previous experience making ethnomusicological recordings, they had expertise in making collections. During the expedition they visited the Noanamá, who lived in the delta of the Río San Juan on the Pacific seaboard, the Tukano groups of the Río Piraparaná, the Kogi and Bintukua (Chibcha) in the Sierra Nevada de Santa Marta, the Guajiro (Arawak) in the Guajira Peninsula, the Casacará and Maraca who are both sub-groups of the Yuco-Motilon (Carib) living in the Sierra de Perijá and the Cuna (Carib) in the Gulf of Darien on the border with Panamá. 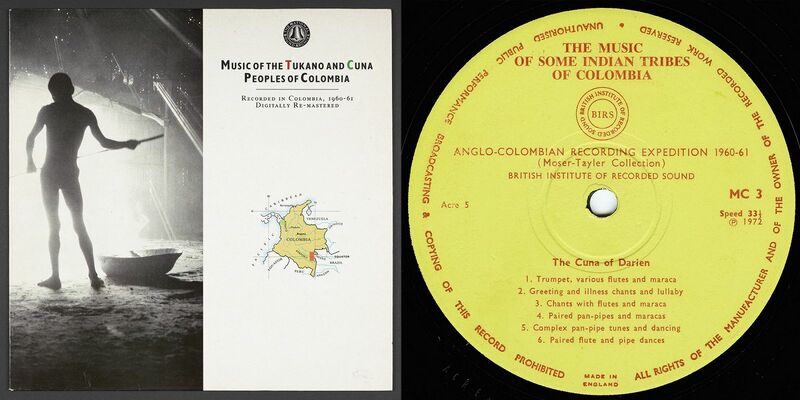 Centre label of box-set release of the Anglo-Colombian Recording Expedition recordings by the British Institute of Recorded Sound, LP cover of re-issue by Rogue Records and the National Sound Archive. The opening songs were recorded in a small village in the northern Sierra of Perijá, where two Indian groups, Casacará and Maraca, both sub-groups of the Bari Motilón, thought to be of Carib origin, live in close proximity. This first song is a song duet called shatle sung in unison by two men. You can hear a four-note melody, which in other recordings of Casacará music, is repeated on the pipe as flute and voice are often interchangeable. Then the clear singing voice of a lone man, who with a rooster crowing in the background, delivers another four-note melody. At the start of this excerpt you can hear Brian Moser, saying “Espera, espera…”, Spanish for “Wait, wait…”, before the group of men begins whistling. This is a common Casacará tune, whistled and sung by men as they go to their gardens or visit another village. The majority of Casacará songs begin with whistling the tune, which in turn is then sung. Some Casacará songs also end with whistling. Usually the songs last for at least one minute, and may continue for four or five. The last part of this sequence dedicated to Casacará music features a few drinking tunes, combining song and speech, sung by men. The words “Yakono wap se…” act as a reminder for friendliness during chicha drinking parties, occasions when fighting often breaks out, particularly when members of other villages or groups are presents. We hear a Spanish speaker announcing the arrival of the musical group by airplane – “En estos momentos está aterrizando en el aeropuerto Simón Bolívar, el avión colombiano HK793, de líneas aéreas Taxader, con los integrantes del conjunto folclórico de Tejicondor, procedentes de la ciudad de Medellín. Este grupo artístico viene a las festividades de la tercera fiesta del mar en la ciudad de Santa Marta, que, muy bienvenidos”. 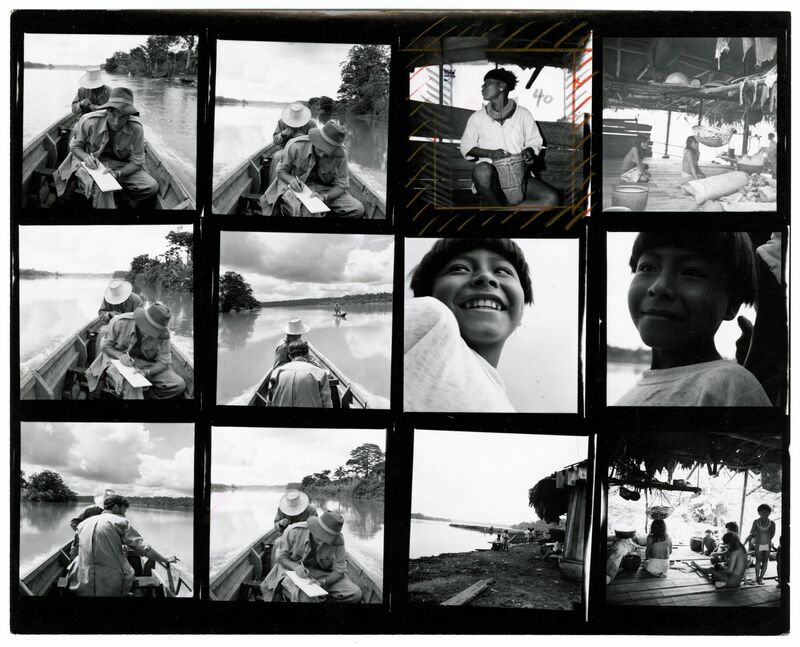 Contact sheet of photographs taken on Río San Juan featuring Donald Tayler writing, behind him, Nestor Uscátegui, ethnobotanist specialised in narcotics and stimulants among the tribes of Colombia; maloca scenes and unnamed Noanamá people. MOSER, B & TAYLER, D. (1963): “Tribes of the Piraparana” Geographical Journal, 129, 4, 437-49. London.